God Mode is essentially a horde mode for 1-4 players. If you try and play solo, you’re going to have a bad time. It is highly suggested that you wrangle a couple friends for co-op play or use the quick match option to make some quick random allies. This third person shooter is a budget title that is quite simple. You select one of the five mazes, which act as arenas for enemies to pour into. It is up to your team to make them regret their decision of stepping into the ring. Each level is beautiful, but basic, and you will spend most of your time backing up and running while you shoot. It kind of makes me think that all the monsters from Serious Sam have made their way into hades after being killed once. 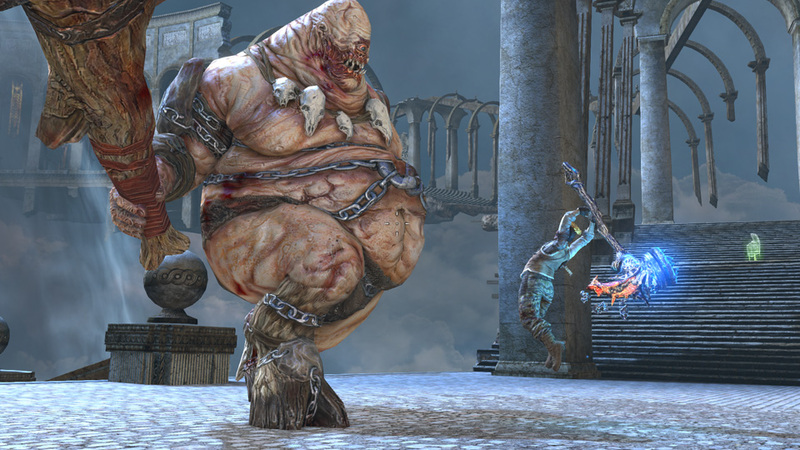 Enemies range from zombies and skeletons to larger, more fierce Greek types like Minotaurs and Cyclopes. Even though most of the variety comes from palette swaps, you won’t be able to tell the difference when you are pouring ammo into an endless crowd of monsters. God Mode does some smart things to stretch out the content. Random mutators are activated at the start of each area. These ‘Tests of Faith’ range from beneficial, like invulnerability or infinite ammo, to detrimental, switching on friendly fire to downright weird, like giving the enemies party hats. While not all Tests of Faith affect gameplay, the best ones will force your co-op team to change playstyles. “Bombs” will have exploding barrels rain from the sky, while “Dice” will randomly switch everyone’s weapons. These slight changes help in the replayability of God Mode, and combat the small amount of available levels. If your team is finding things a bit too easy down in the underworld, you can choose to activate Oaths for a challenge. Oaths are additional modifiers that have adverse effects on the whole team, in exchange for more gold and experience throughout the match. You can do less damage, play without shields, or turn on all eight if you want your team to stop being friends. It is definitely a risk/reward system in play that will require communication and team play in order to succeed with the ludicrous combinations of Oaths and random Tests of Faith. God Mode isn’t all that difficult with a team, at least on the default (Bronze) setting, but you can also crank it up to Silver or Gold to increase the challenge.